Hoverboards or self-balancing scooters are common these days, especially for the young generation. Hoverboards were never created for only kids to have fun, they were actually created for people for almost all group ages to use them as a personal transporter and something to have fun with. The market is loaded with different hoverboards with different specifications and when you are going to buy the best hoverboard for adults, you need to get the very best in terms of the power of the motor, the quality of battery and the overall construction. However, bearing in mind the fire incidents reported a few years back, it is essential to look for the certified one. Before buying, it is ideal to look for one that will ensure that you can maneuver properly even on unpaved surfaces. This is where off-road Hoverboards come. The most important safety hazard you have to be aware of when it comes to hoverboards is the battery systems. 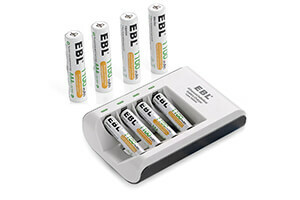 Most modern electronics use a battery technology known as lithium-polymer or “lipo” for short. Lipo batteries are pretty much the best overall battery for consumer products. They’re on your laptop, your phone, and every other rechargeable hi-tech gadget. The downside is that, compared to other, less-powerful battery types, they aren’t particularly stable. It’s not that rare for a lipo battery to catch fire or explode, especially if they haven’t been made with the experience and precision you’ll find at manufacturers like LG or Samsung. It’s vitally important that you make sure that any hoverboard you buy has the proper safety certification. It has to have UL certification and preferably protection systems that prevent overcharging, overheating, and short-circuiting. Not all hoverboards in the market are as good as they brag and that is where you need to be careful before spending your money on them. This is why we have rounded up the best off-road self-balancing scooters as the best place to start. This lovely beast is UL 2272 Certified. The wheels size is 8.5 inches coming along with Vacuum Tyre Bluetooth Speaker. The stereo speaks with premium sound quality can be connected to any devices which have Bluetooth connectivity like Computer, Laptop, iPhone, Samsung Phone, or any other Android Phone… The battery power guarantees a long life with 36 Volt/4000mAh while also being zero emissions, safe, environmentally friendly. You can buy it for your kids if you are a parent for their birthday present. It can also be used outside on the concrete road and on the carpet as well. The board is very sturdy and well made, and it is pretty heavy though. The charging time is between 90-120 minutes with Charger Charging Voltage included. The runtime is about 20 km with the maximum speed of 10 Km/h. You will love this one. 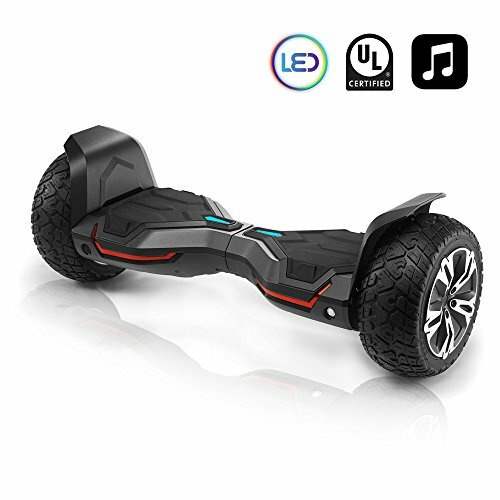 Bluetooth version makes your hoverboard be connected to your smartphone, you can listen to music directly when you are riding it. The flashing lights will make you safe in dark place and also give you a unique experience. This hoverboard is able to ride in 15-degree climbing gradient which is suitable for most terrains. It has been made to look bigger and sleeker at the same time. The design and the overall finishing in impeccable and there is no way this hoverboard might fail to get your attention right away. 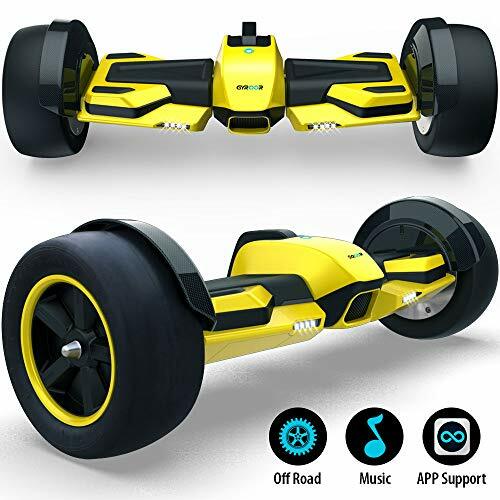 It is big, easily takes up to 220 pounds, the wheels are big and rugged and backed with a powerful motor, you would love to take it to the places where most of the hoverboards in the market will fail to roll their wheels. The maximum riding speed is of 10 mph and the charging is 1-2 hours. 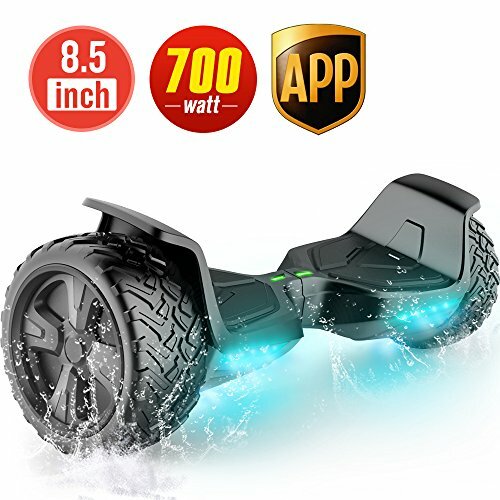 All these features would make this hoverboard be a great choice as a gift for everyone who would like to give it try with unique experience. The Epikgo sports self-balancing scooter is here to make a difference in your hoverboarding. Just like other product from the company, his hoverboard is premium with impressive features to delight your riding experience. 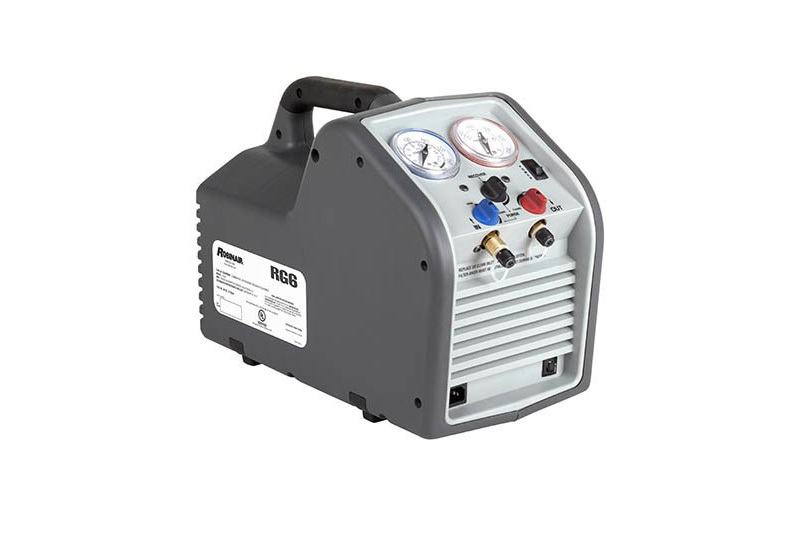 Fitted with dual 300 W motors, the enables it to climb 18d degrees slopes. 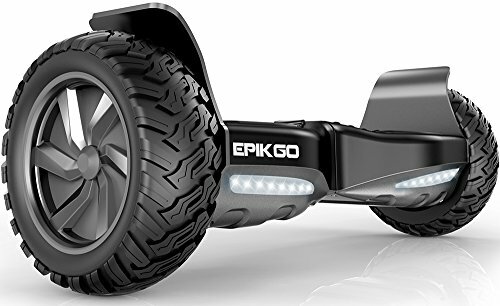 The performance tires on the EPIKGO Sports Series transfer more power from the board to the ground. Created from pressure- crafted metal, the wheels on the Sports Series give your board strength and style. The 8.5” alloy wheels on the Sports Series are 30% bigger than the leading competitor’s. More foot space, stability, and control for increased balance in both wet and dry handling. With certification from UL, there are no battery problems, overheating or short-circuiting. In overall, the board is 30 percent larger than normal ones, thereby ensuring improved performance. The overall built of this hoverboard is very strong and reliable and you won’t see yourself complaining regarding anything at all. 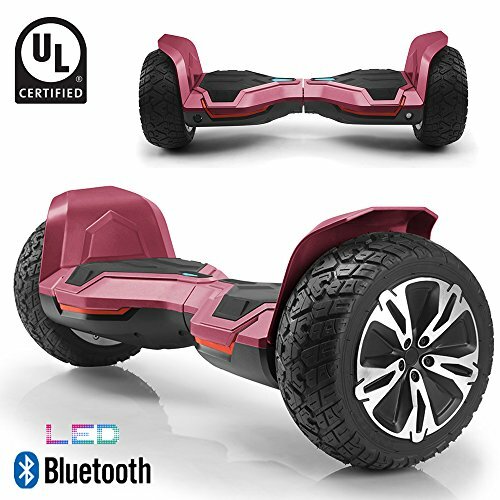 This hoverboard has passed all UL safety regulations, has been certified for best safety standards is completely safe to use for you and your family. The motherboard is improved with professionally tuned gyro sensors that offer you the smoothest ride. Stronger shell plus enhanced chassis provide unmatched product durability. The durability of this hoverboard is unmatched and you won’t ever regret the money you spent you this beauty. Classic LED lights are given on the front which will guide your way in the night and make the hoverboard look even cooler. On top of the quality and class that this hoverboard offers, it also comes with a one year warranty from a brand that you can trust. Ride at night and be seen with the built-in bright LED Lights with class. Travel in style, sure to be a head turner wherever you go. Go-Bowen’s New Self-Balancing Scooter is a hoverboard with 8.5″ wheels AND built-in Bluetooth. If by some miracle you don’t know what a self-balancing scooter (aka hoverboard) is, it is a Segway-like stand up personal transportation device without handlebars. All you have to do to ride a hoverboard is simply step onto the board with both feet and lean in the direction you would like to go. Powered by a 36v 4.4ah Lithium-Ion Battery and a 350-watt hub motor, it will get you anywhere you want to go. And the larger 8.5″ wheels will give you added stability over the smaller 6.5″ wheels. It comes standard with Bluetooth compatibility, LED lights. The Go-Bowen brand brings you a high-quality board without the high price. This UL balance supports electrical and fire-safety testing and certification under UL 2272, safe for you and your family. The board has connected to Bluetooth speaker so that you can play music directly from your phone and rock out while you ride. This two-wheel self-balancing scooter can provide the riders with unmatched riding experience. It can travel at a top speed of 10km and cruising distance up to 16 km. 8.5 inch RUGGED TIRES is designed for all-terrain exploration and provides smooth riding experience, easy to control. With the stronger shell and sturdy structure, this best self-balancing scooter is perfect for your needs. It also has a compact design and it’s simple to set up. The bright LED front lights can illuminate the night roads and increase fashion for this scooter. Its compact size also makes this scooter portable, easily carried around wherever you go. 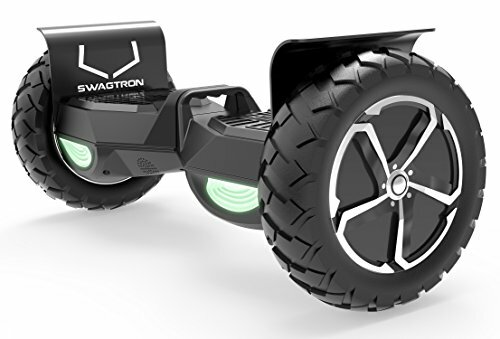 Take your swag off-road with the all-new T6 from SWAGTRON! Whether you’re traveling along gravelly mountain roads, skimming across grassy plains, or trekking through muddy terrain, SWAGTRON balance scooter has got you covered. This hoverboard is the first one in the market capable of taking on more than 380 pounds. It should be renamed as a monster hoverboard because that is exactly what it is in terms of looks and performance. It will surely cost you big bucks compared to the usual hoverboards available in the marker but then again it is not any usual hoverboard, just by the looks of it you will admit that the price is justified. When it comes to the built, this guys is second to none and has been constructed flawlessly to give you a smooth ride that considering the weight capacity no other hoverboard will do. With a superior SentryShield lithium-ion battery, the T6 electric scooter charges in just 2-3 hours; so you’re never far from your next ride into an adventure. Use the SWAGTRON app to connect to your T6 via Bluetooth so that you can play music directly from your phone and rock out while you ride. A UL2772 certification means that you can ride with confidence, knowing that your electronics are completely protected. The T6 motorized scooter comes with a 12-mile range and can reach speeds up to 12 mph (for safety, speed is governed at 7.5 mph). It has been constructed in a way that it can be used by kids as well as adults therefore, this scooter could be the only one scooter your whole family needs to have fun with. 12-mile range, and the capability to reach powered speeds of up to 12 MPH. Bluetooth® to play music directly from your phone. To ensure the quality and durability, the Gyroor Warrior Off-Road Hoverboard has tested for safety, passing all tests and is UL certified, making the GYROOR warrior G2 hoverboard absolutely safe and harmless for all level of riders. Gyroor Warrior is made from durable aluminum and certain ABS parts to ensure a pretty strong body that is sure to stand the test of time. This means that you can use the hoverboard for a long time without having to bother about the longevity of the casing. This board can handle bumpy pavements, gravel, grass, sand, and dirt paths, allowing you to enjoy a smooth ride while getting the best out of your self-balancing hoverboard. 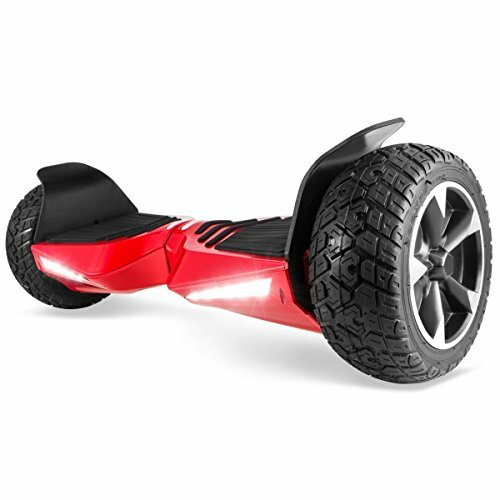 The great quality Bluetooth speaker and beautiful LED lights add to the magnificence of this Off-Road Hoverboard. Powered by 350 watts powerful dual motors with solid shock absorber tires you can easily ride faster with more stability. 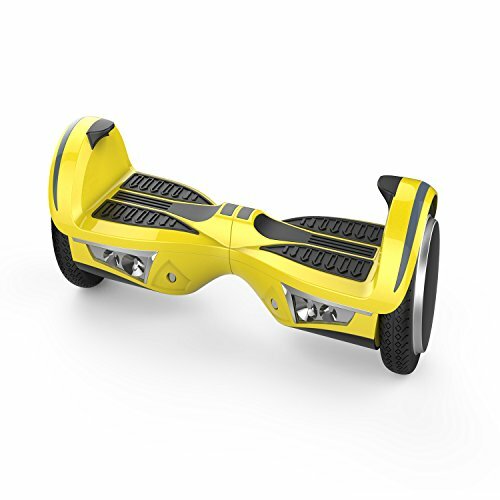 Its self-balancing mode helps you to get balanced in less than a minute. This is the smartest hoverboard you can get in the market today as it allows full stability for even the new riders, making it a perfect gift choice and favorite for kids. The TOMOLOO V2 Eagle is armed with a 350 watts electric motor giving it the edge it requires to climb extra steep curves. 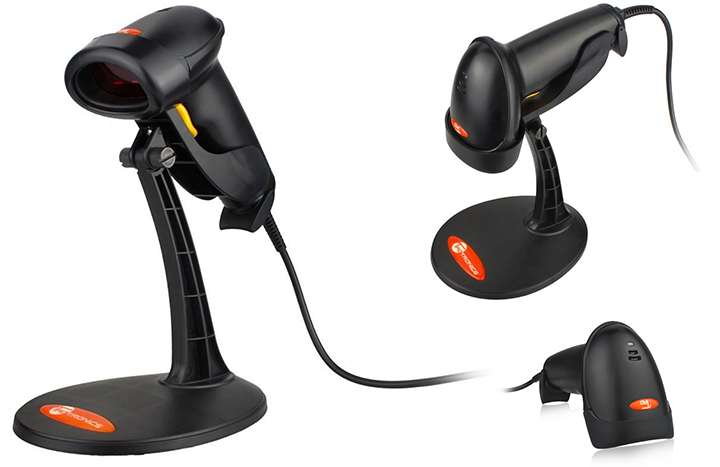 Compared to others, the TOMOLOO V2 Eagle is lighter in weight, giving it even more mobility. All-terrain design lets you easily travel over puddles, sand, dirt, and grass. The V2 is suitable for everywhere. You can enjoy high quality 4.1 stereo surround sound audio on your rides with ease. 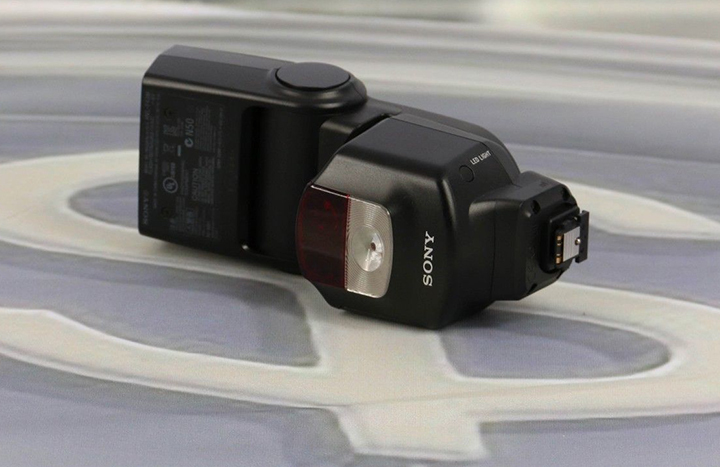 This is a cool feature that can make your rides even more fun whether you are riding to work or just drifting around in your spare time. The app lets you customize the color of the headlights on your board to your liking. The off-road hoverboard supports up to 16 million different headlight colors. Additionally, the app lets you use GPS and even get in-depth details such as travel time and current speed. The app is also handy for keeping track of how much battery is left. 12 miles per hour is the fastest speed you can get with the current off-road hoverboards on the market. 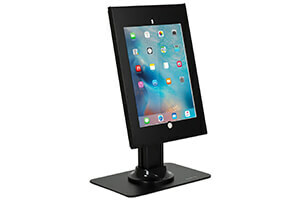 Made from strong aircraft-grade aluminum alloy frame that allows it to handle heavy loads. The 6.5-inch rubber all terrain tires also allows a more comfortable riding experience on different road condition. his hoverboard comes for a very fair price which definitely gives its competitors a run for their money. The overall construction is very sturdy and solid, this machine has been built to last a really long time and the design is so cool that it will never seem old. 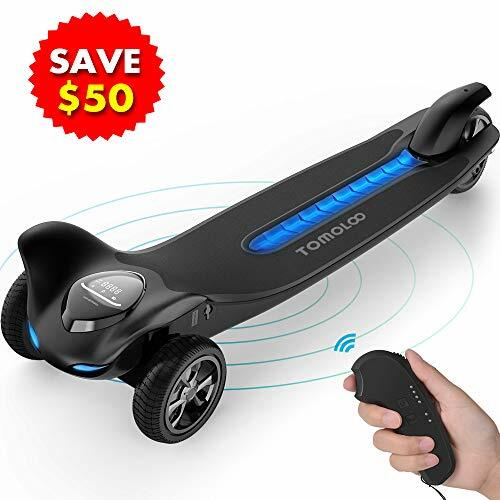 Equipped with top-of-the-line 2V/4A Samsung battery to maintain for up to 9 to 12.4-mile range, Dual 350w motors that give the TOMOLOO Hoverboard power that you can hit the max-speed of up to 12 mph, easily climb slopes and maneuver close spaces. This is a new generation flagship hoverboard that offers you a lot more than most of the hoverboards in the market. 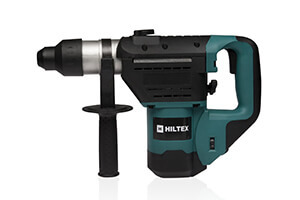 It has been constructed with aircraft grade aluminum alloy frame and fulfills the highest of safety standards. The self-balancing feature, which is perfect for new riders, is complemented by a dedicated iOS app that can control the hoverboard and monitor performance. 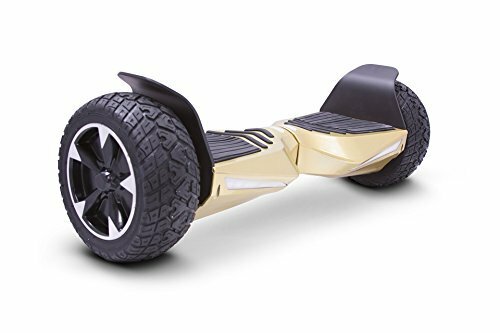 Getting the best all terrain hoverboard is an excellent step in enhancing mobility and fun everywhere you need. Unlike other self-balancing scooters, off-road ones are applicable to all forms of surfaces. Our top 10 best hoverboards in 2019 are the most trusted products that you would regret buying.